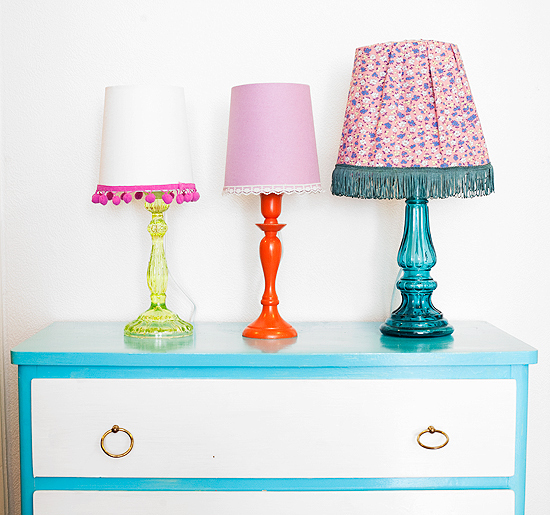 Have you ever seen those lamp kit adapters that you can use to make a lamp out of an old bottle? Well, Cia showed me these lamps that they had made. Same technique but with candelstick holder instead of bottles. Love the idea. If you´re in Sweden you can buy the lamp kit adapter here! This is gonna be one of my next projects! Thanks for sharing this via April Buddy DeerDot. Those are adorable and what a clever idea! Gud vilka härliga bilder, super mysig blogg! i have to find that in France! Hey, great! I love this idea! I have two candle holders I never use and actually other one is exactly the same than the green one in a pic. :) Need to check their sites. Thank you!